1. COVENT GARDEN - Potentially the most decorated neighbourhood in London! You won’t be disappointed with a wander around Covent Garden. Head straight to the Market to see all the decorations and the beautiful tree. The streets surrounding the market are also full of stores and restaurants vying for best window display and last but not least the lights at Seven dials. 2. SOMERSET HOUSE - This could actually be our very favourite place to visit during the holidays! We don’t skate, but we love to come and people watch at the rink and marvel at the beautiful tree. Plus we have a tradition of heading into the Fortnum & Mason pop-up for a (spiked) hot chocolate, before choosing a new decoration for our tree. 3. NATURAL HISTORY MUSEUM - We love how the skaters get to zoom around the tree inside the rink. The Museum itself is one of the most beautiful buildings in London and provides such a stunning backdrop. 4. ST PAULS CATHEDRAL TREE - One of our favourite spots year round, St Paul’s Cathedral looks even more lovely with the huge tree on its doorstep. 5. SOUTHBANK CENTRE CHRISTMAS MARKETS - Just across the bridge from Somerset house you’ll find the Southbank Centre Markets. Filled with a mixture of food and gift stalls this is a popular spot on the weekends. There is also the Cider lodge and tree maze to visit too. Walk a little further East along the bank of the Thames and you will find yourself at the Tate Modern Markets another festive spot worth mentioning. 6. ST PANCRAS INTERNATIONAL STATION TREE - The tree at St Pancras station is always a little quirky and unusual so its fun to see the new idea every year. 7. WINTER WONDERLAND -Yes its touristy and yes its crowded, but we still visit this spot every year to soak up the energy and excitement of London’s biggest Christmas Market. There’s skating, shopping, rides, a German food hall and plenty of mulled wine stands to keep everyone happy. We had the best waffles (outside of Belgium) that we’ve ever had here a couple of years ago. 8. TRAFALGAR SQUARE TREE - Another iconic tree you have to see if you are in town in December. Every year the tree is gifted from Norway and transported to the square in time for Christmas. 9. OXFORD STREET LIGHTS - You couldn’t visit London at Christmas without an Adventure to the busiest shopping street in Europe. And boy does it look pretty with all its lights on. Just be prepared for the millions of other tourists and locals who will also be there to take their selfies. 10. 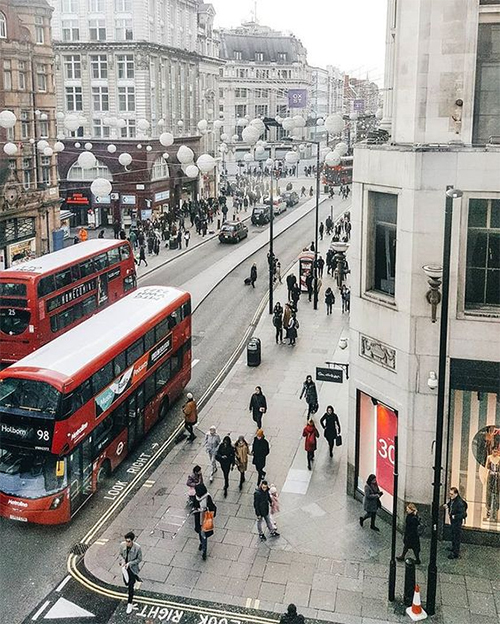 REGENTS STREET, CARNABY STREET & ST CHRISTOPHER PLACE LIGHTS - While you are visiting Oxford Street make sure you leave time to check out the light displays in these streets too . 11. CHRISTMAS STORE WINDOW DISPLAYS - There are so many we can’t name them all! 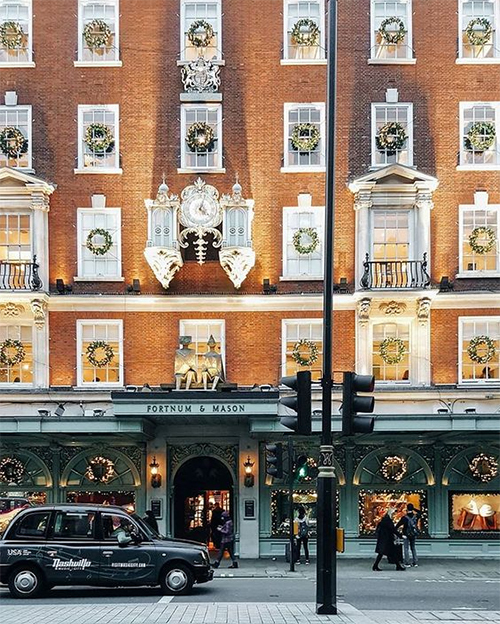 but a few of the most popular are Selfridges, Liberty, Fortnum & Masons, Tiffany, Cartier, John Lewis and House of Fraser. 12. MAYFAIR - Mayfair knows how to decorate for Christmas and its worth just taking a stroll around to see what you can find! Put a pin on your map for New Bond Street, Annabel’s, St Jame’s and The Ritz. 13. SLOANE SQAURE & KINDS ROAD, CHELSEA - Theres a tree in the square and a whole string of shops that go all out with their decorating in this area. Make sure to swing by The Ivy, Chelsea Garden; every year it’s display is one of the best! 14. SKYLIGHT - Rooftop ice rink, check. Heated Igloos, check. Raclette cheese for dinner? check. This not so well known spot can be found next to the Tobacco Docks in Shadwell and is great for a night out with friends. 15. 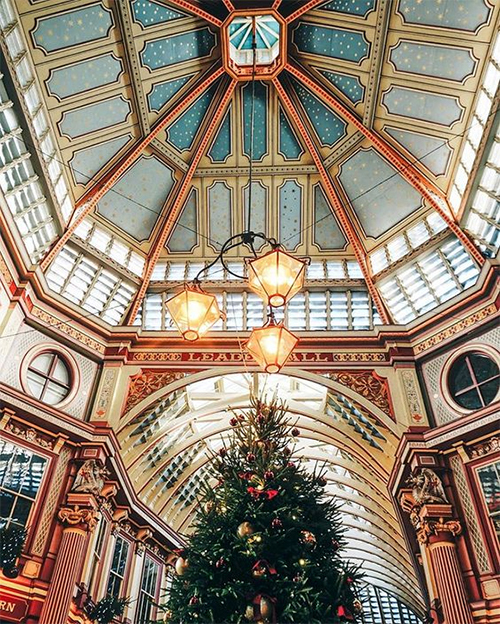 LEADENHALL MARKET -Inspiration for Diagon Alley in Harry Potter, this shopping market is so beautiful and detailed. There is a real tree bere and there are so many spots for a photo. 16. CHRISTMAS AT KEW - OKay OKay so wee said 15 and this is one we actually still haven’t done ourselves, but we hear the lights at Kew during the dark Winter days are ones to see. A few extra bits and pieces worth mentioning: Zetter Townhouse, Winterville, the riverside Igloos at Coppa Club, hotel lobby trees, Old bond street decorations. Camden Passage, Marylebone High Street and Spitalfields. Our biggest suggestion when visiting the capital (and one of our favourite things to do at anytime of the year) is to put on your walking shoes and just wander aimlessly around town! We are always surprised by what we stumble upon and constantly in awe of what a beautiful city London really is. And at Christmas it is pure magic. Do you have a favourite Christmas spot in London? We’d love to know your suggestions.